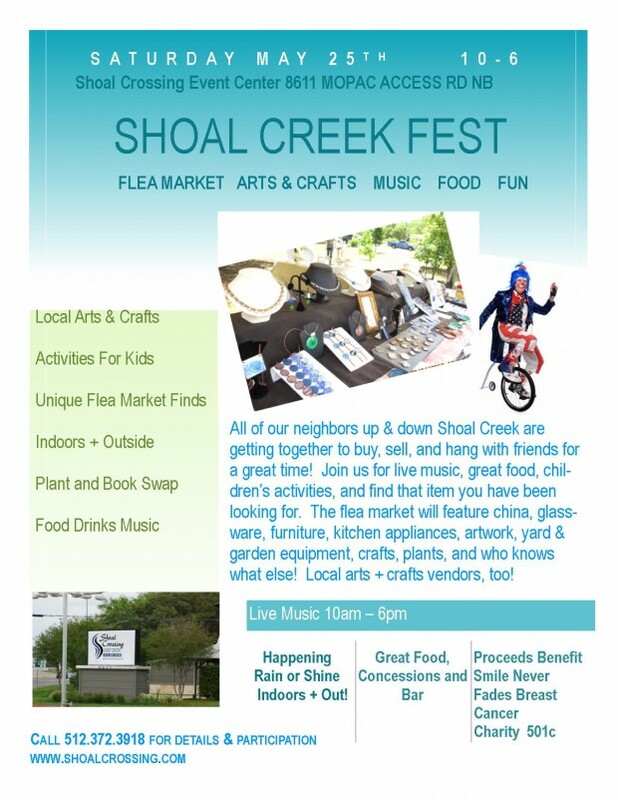 Shoal Creek Fest at Shoal Crossing!!! All of our neighbors up and down Shoal Crossing are getting together to buy, sell and hang with friends for a great time! Join us for live music, great food, children’s activities and find that item you’ve been looking for. The flea market will feature china, glassware, furniture, kitchen appliances, art work, lawn & garden equipment, crafts, plants and who knows what else! Local Arts & Crafts vendors too! Proceeds benefit The Smile Never Fades – A Breast Cancer Charity. Inside & Outside, Rain or Shine! The Smile Never Fades is a volunteer-based organization. Whether you can participate regularly or just once a year, your support is vital to our mission.